His full name is Domingos Manuel Filipe Catete, and he is now 32 years old. He made his way from the province of Malanje to the Angolan capital, Luanda, to find work. He was only 24, on May 16, 2008, when he had a few too many drinks one Friday night and passed out in a stranger’s minivan. He has been locked up ever since, held under “preventive detention” in Luanda Central Penitentiary, the jail known locally as CCL (Comaraca Central de Luanda). What happened to Domingos Catete follows a pattern of similar cases across all the jails in Luanda. In almost every case of preventive detention lasting more than six years, the victims are provincials from out of town, with no close family. They drift to the capital in search of a better life, steady work. They have no relatives willing to bribe the authorities to let them go. So there they languish. There is a second clearly-identifiable pattern: physical abuse and ill-treatment, even torture, by National Police and Criminal Investigation officers, to extract confessions from the detainees. There is no investigation, just a beating. I recently reported similar cases, such as that of 26 year-old João Domingos da Rocha who spent seven years in preventive detention on suspicion of having stolen second-hand clothing. And Justino Longia, accused of a similar crime, who’d been in preventive detention for five years. Both were set free, but only after their cases made headlines. Maka Angola contacted the General Command of the National Police about this case, shared the information obtained and now awaits an official response. “Preventive detention, even with extensions, should last no more than 210 days and be reserved for crimes against State Security,” Says Godinho Cristóvão, a spokesman for the Association for Justice, Peace and Democracy (Associação Justiça Paz e Democracia, AJPD). Godinho Cristóvão lists all the possible charges that could have been laid against the prisoner: damage to property (if he had broken into the car), or trespass – but in any case the maximum punishment for these offences would not exceed a two-year prison term. Bricklayer Nelson de Assunção Manuel, aged 26, has been held since August 17, 2011. That’s four years and eight months in preventive detention in Luanda Central. He is another example of police brutality in extracting forced confessions. “It was 8am and we were preparing the materials for a house we were building in Kapolo I neighbourhood, when suddenly a small boy appeared with a police unit. The boy pointed at us and said we were thieves.” There were six workers on site, bricklayers and labourers. Nelson Manuel says the group was only questioned for the first time in 2013, then again last year in 2015 in the same group interrogation that Domingos Catete described. There was no further development. Physical abuse and torture are prohibited under the terms of the Angolan Constitution (Article 36). 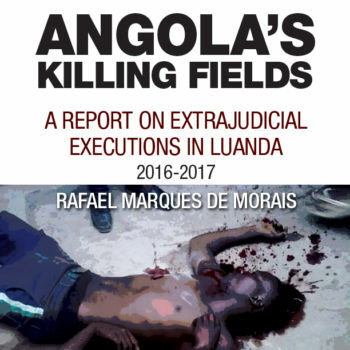 “In cases where the law is clearly being breached, whether because the term of preventive detention has exceeded the limit, or because of the use of violence to extract a confession, the law has a provision for the public prosecution to free the detainees”, explains Maka Angola’s legal analyst, Rui Verde. “Failure to do so is a failure to comply with the law, and a violation of fundamental human rights” he adds. According to Rui Verde, a public prosecutor who holds suspects in preventive detention beyond the limit can be prosecuted in both criminal and civil courts for the ensuing damages. “Obviously there is a hierarchy. The attorney-general of the Republic has to ensure his/her subordinates comply with the law, and exercise sanctions for non-compliance. Otherwise, it’s the Attorney-General him/herself who can be held directly responsible and who could be prosecuted”, he continues.